When I came back to finish my cross-Wales walk in 2006, I only had a single full stage to complete, the traverse of the Carneddau described on my cross-Wales page. There was a clear need to do something else while I was there; completing the Welsh 3000 footers was my choice. 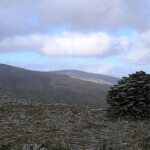 The ridge of the eastern Glyders formed one walk, and this round of the western Carneddau the other. There is a good panorama of the western tops of the Carneddau from the vicinity of Gwern Gof Isaf. I had plenty of time to savour this over three days, just by stepping out of the farm’s bunkhouse door. But they are laid back somewhat from here, and for more dramatic views you need to get closer up. The view from Ogwen Cottage of the first on the circuit, Pen yr Ole Wen, is especially dramatic, its shattered southern face looking daunting, as indeed it is; primarily scramblers’ territory, there is a walkers’ route but erosion is taking its toll. I chose the south-east ridge from above Ffynnon Loer, an enjoyable climb after an indistinct start above the wall at 666617, with a good little scramble just above a patch of quartzite visible from some distance away. 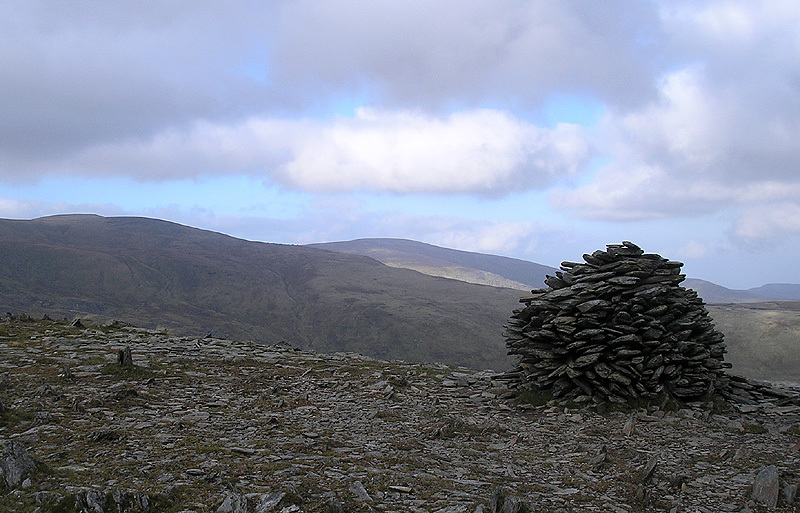 It’s a characteristic of the Carneddau that once on top there is little up-and-down. Indeed in the mist I went a few yards past the top of Carnedd Dafydd before realising it was there. The cloud lifted thereafter and to pick up Yr Elen I contoured below Carnedd Llewellyn’s peak on its western flanks, coming out just above the col between Llewellyn and Elen. I found no contouring track but no difficulty either. Yr Elen is a lovely little viewpoint, with good views back where you had come and down into the cwms below. Carnedd Llewellyn itself has a reputation. Guide books say it is confusing in mist owing to the breadth of its summit and the multiplicity of paths and ridges. Well, I was a newcomer, a little bit of cloud hung around, but it was nothing like a conundrum. From the col after Yr Elen, or anywhere else really, it’s just a case of walking uphill till you can’t any more. Once on top, take a bearing certainly, locate the relevant path and keep on line. It might have been different long ago (1974?) when the hills were less walked, perhaps. On my route off, above Craig yr Isfa, there is one little scrambly descent that needs respect, but no more. By the col below I had enough time in hand to pick up Pen yr Helgi Ddu as well; it’s a sharp pull up from the col (not one I would have been keen on in descent), but the top is broad, the summit not immediately obvious but pick the big circular cairn, and a long, easy, grassy descent with Tryfan and the Glyders in full view follows. 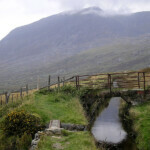 By the time you reach the leat draining Llyn Cowlyd, you’re nearly home. In 2011 I came back to the area to pick up some of the Hewitts in the area below 3000ft – more information coming soon. On one of the routes, aimed at the northern heights of Llwytmor and Bera Mawr, it was quite natural to revisit the 3000-footer of Foel-Fras as well. The walk began from the B&B of Rhiwiau Isaf, to which I had walked the day before over Tal y Fan from the Conwy valley. From here I picked up the waterworks track along Afon Anafon to its llyn, the Hewitt of Llwytmor (2749ft) towering above and gained by a straightforward though a steep and sometimes heathery climb of its NE ridge. The twin peaks of Bera Mawr and Bera Bach were barely a mile away SW, but with the deep trench of Cwm Goch in the way, the sensible route is to take the easy climb SE up to the summit of Foel-Fras (3091ft). At least this time I had a view, unlike five years previously, and a grand one it it too. Those twin peaks are a little surprising. 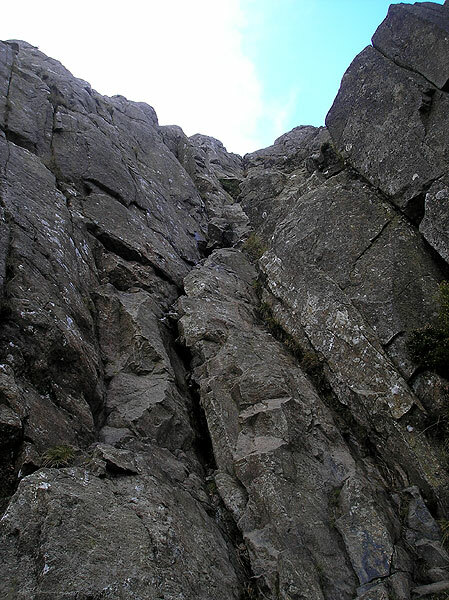 My objective was, naturally, the higher, Bera Bach (2648ft), on a direct line to my objective the village of Bethesda. 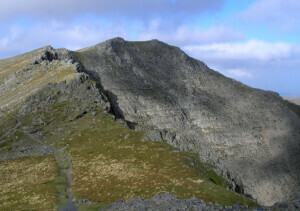 When I got there though, on a clear still day on which I had made good time, Bera Mawr (2605ft) was only a few hundred yards away and unlike its neighbour presented an interesting jumble of rocks for its summit, so I popped across to have a look. 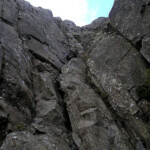 It’s hardly a scramble to attain its highest point, but you do need to use your hands a bit. It’s as well I did; by some quirk of topology, it’s Mawr that qualifies as the Hewitt, not Bach; indeed there’s a clue in the names, for mawr = big and bach = little. From here it’s a simple continuation over Drosgl (2484ft), the day’s final Hewitt, and Gyrn Wigau (2110ft), down to the former mining village of Bethesda, which has the very useful Snowdon Sherpa bus service to Ogwen Cottage and beyond – it took me back to the bunkhouse at Gwen Gof Isaf where I would spend a couple more days. 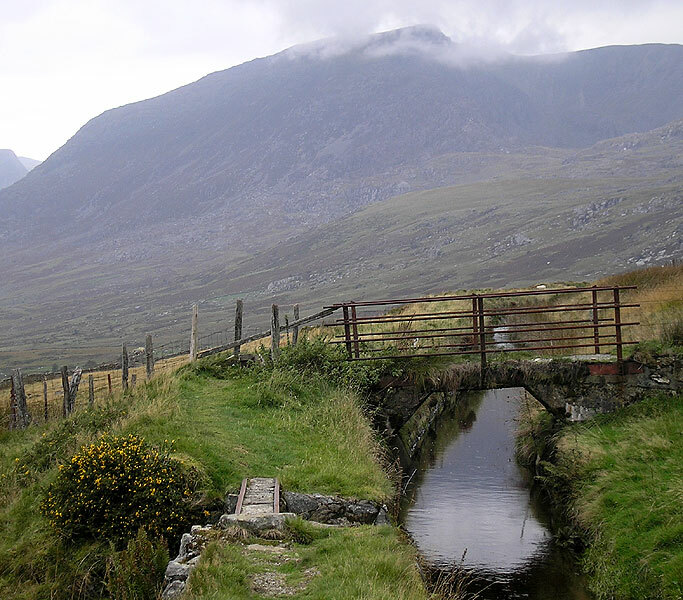 For a description of the long traverse from Gwern Gof Isaf to the sea, see my cross-Wales pages.